The Paisley Terrier was similar to other small terrier breeds such as the modern Yorkshire Terrier its relative the Skye Terrier. They had extremely long, silky coats that covered their eyes and dragged across the ground, short legs, a longer body, and a small head. Their snouts were slightly smaller than other terriers, giving them a smushed face. Because of their wide jaws, they were trained and used to kill rats. The hair that often covered their eyes was usually either tied back or trimmed to allow them to see. More relaxed than other terrier breeds, the Paisley Terrier was known to be affectionate and loving towards humans, especially its owner. They were not as good a ratter compared to other terriers, but they would follow commands when necessary. Along with being slightly lazy compared to other small dogs, the Paisley Terrier was known to be less dog aggressive than other dogs and was overall more submissive and laid back. They were also known to have separation anxiety. When left alone for too long they would bark endlessly and became aggressive without their owner with them, resulting in what we now call Small Dog Syndrome. They were a high maintenance little dog. Because this breed is extinct, there are no records that show the health problems of the Paisley Terrier. These dogs were known to be laid back and calmer than most other terriers meaning that they probably did not need as much exercise than other active terriers. They still would have required regular walks and outings as every other dog and would have needed space to play outdoors. There is no evidence of their lifespan although they most likely would have lived to be around 10–14 years. There is no evidence of their litter size although they would most likely have had between 1–5 puppies. These dogs were the epitome of grooming. Because of their long coats, they needed to be groomed regularly, sometimes daily. They had long hair that would reach to the floor, easily resulting in knots and tangles. Owners would need to wash their coats frequently and brush them until their coats were silky smooth. Their intense grooming needs may have contributed to their extinction. The Paisley Terrier descended from its ancestor the Skye Terrier which is similar in appearance and temperament. Records from 1440 use the word terrier, telling us that the Skye Terrier was not the first of this group although we have little evidence from before the Skye Terrier. In the French Language “terrier” is translated to the phrase “Chien Terre,” which translates back to “Earth Dog”. This is fitting for the terriers as they were bred and used for catching rats and small rodents in the ground. There are records that show that the terrier group was around in the 10th century and experts say they were around well before then. Remains of what is thought to be the Skye Terrier or a terrier-like dog was found at an Archaeological digging site in Scotland that proved that terriers were around during the Roman times in both England and Scotland. Terriers back then would have been used the same as today, hunting small animals that dig under the Earth. Nothing is known for certain about how the terriers originated, probably because a lot of the farmers who bred them were illiterate and no records were kept of dog breeds during that time. Some say that terriers were first bred and used by the Celtic Tribes while others think that they came after the Celtic Tribes within the same location. Most agree that terriers originated in the British Isles as they were only known outside of Britain 200 years later. Many think that terriers were descended from British breeds such as the Scottish Deerhound, Canis Segusius, and the Irish Wolfhound although this has never been proven. Farmers prefered the small terriers because of their ability to hunt and chase small pray away from their crops and livestock. This prevented possible sickness towards the animals and also prevented the small rodents from eating or ruining the plants. Because people were poor and starving during this time, terriers were strictly kept as working dogs and not as pets or companions. A common practice was to put the terrier and an otter or badger in a barrel together in order for the terrier to prove its worthiness of being a working dog. If the terrier killed the other animal, it was taken by the farmer in order to become a working dog. At this time the terriers used had wiry coats, unlike the Skye Terrier which had a more silky coat. 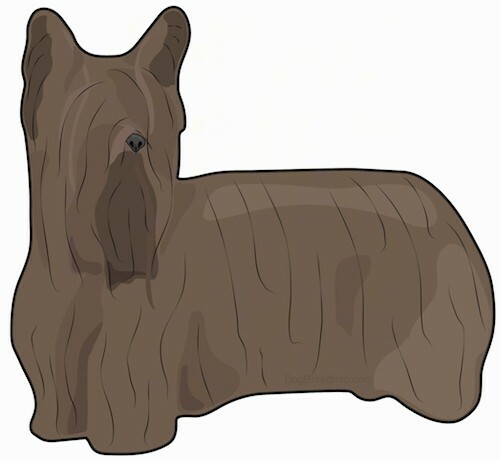 The Skye Terrier was found on an island located north of the Highlands on the island Hebrides. This breed had a longer body and was most likely crossed with Corgis who also inhabited the island. Skye Terriers were kept as both a working dog and a companion dog, especially in Scotland where it became one of the most popular breeds in the country during the 1800’s. Shortly after this time, the industrial revolution occurred in Scotland, bringing a slow end to the demand of small working dogs. Now Skye Terriers were bred as companion dogs and sometimes traveled with their owners to the factories in order to kill the small rodents in the buildings. Because they were now bred for companionship, people prefered the dogs who had the shinier and more attractive looking coats. By the mid 19th century, the Skye Terrier was bred over and over to the point where it became known as either the Clydesdale (located in the city of Clydesdale) or Paisley Terriers (located in the town of Paisley, near Glasgow). The two names (Clydesdale and Paisley Terrier) went back and forth between popularity throughout the late 1800’s. At the time when Clydesdales became popular, dog shows also started to become a popular sport in Europe. Compared to the Skye Terriers, Clydesdales were prefered by most judges because of their long, silky coats. Because of this, they were bred to further enhance both the length and the quality of their hair. Apart from dog shows, the Paisley Terrier was mostly prefered by women who did not want a toy dog. The Industrial Revolution carried on throughout the 1800’s, bringing immigrants to travel to other countries, bringing their Paisley Terriers with them and eventually they bred with other terriers, changing the appearance in the Clydesdales once again. Some were bred to have shorter length backs while others were again bred to further prefect their long silky coats. Eventually, a famous show dog named Huddersfield Ben became the standard for the Paisley Terriers, making the versions throughout other cities to be called something else entirely. 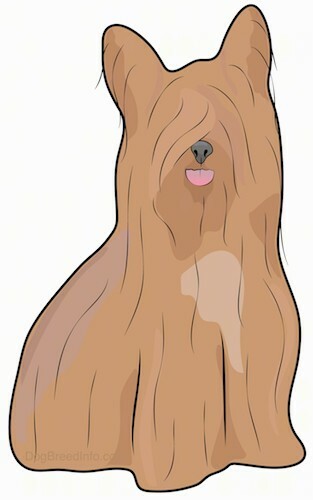 This included a version of today’s modern Yorkshire Terrier and the Lancashire Terrier. Both of these dogs also had different descendants after them as well. With these new breeds that were developed in other countries and cities, there became less of a demand for the Paisley Terrier. Over time, the Yorkshire Terrier overpowered most other terrier breeds and still continues to be popular today. The Paisley Terrier was bred up until the early 1900’s but there are no records of this breed after World War I.